Now that we've fully recovered from our whirlwind weekend, I wanted to share with you some of the yummy that was shared. From impromptu play dates turned dinner parties to game day fun, our house was a bustle of activity this weekend - and I wouldn't have it any other way! I absolutely love when our house is full and adults and children alike are having a ton of fun conversing, laughing, and enjoying great food and drinks. Confession: The more chaos, the more I enjoy the event. Weekends like these remind me of when I was growing up. I have a large family and often even the smallest of events were large gatherings. There would be a large buffet set up and every corner of the house would contain family and friends enjoying each other's company, cheering on their favorite team, or toasting to the holidays. It was such a fun way to grow up and now any chance I can get I fill my home with celebrations. Whether it's a spontaneous gathering or a planned tailgating event, it always amazes me how the kitchen is usually the hub of activity and the food holds center stage. I used to stress about planning the perfect menu, or crafting exciting new dishes to share, but I as time has progressed I realize keeping things simple and traditional make for an easier event all around. Who wants the stress of being a slave to the kitchen? 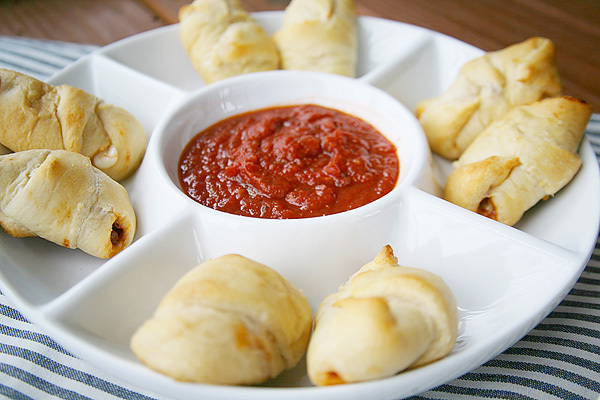 That's why when weekends arise like these, I resort to one of my favorite traditional appetizer recipes. These Italian Sausage Roll-Ups are always a crowd pleaser, and as an avid sports enthusiast, and general food eating aficionado, I suggest you make them to please your crowd too. They are super simple, can be made quickly, and - most importantly - are extremely tasty. The secret is all in the sauce. Literally, the sauce makes this recipe. It's used as a simmering base on the front end, and for dipping deliciousness on the final product. Long gone are the days of me attempting to make my own sauce. 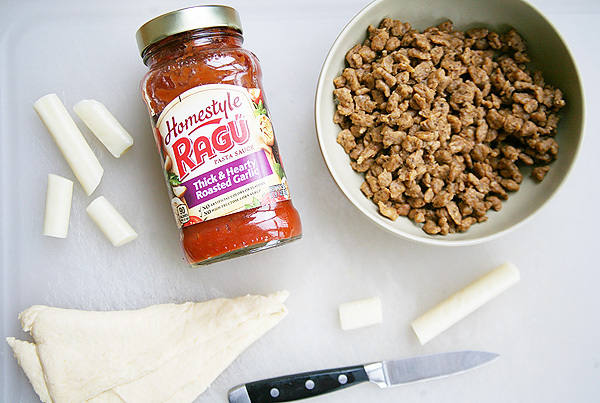 Ragu® Homestyle Thick & Hearty Sauces are perfect for recipes like this. Roasted Garlic was my flavor of choice for this recipe, but there are a ton of yummy ones to choose from (you can find them here). Slice the mozzarella sticks into thirds and set aside. Brown the ground sausage. 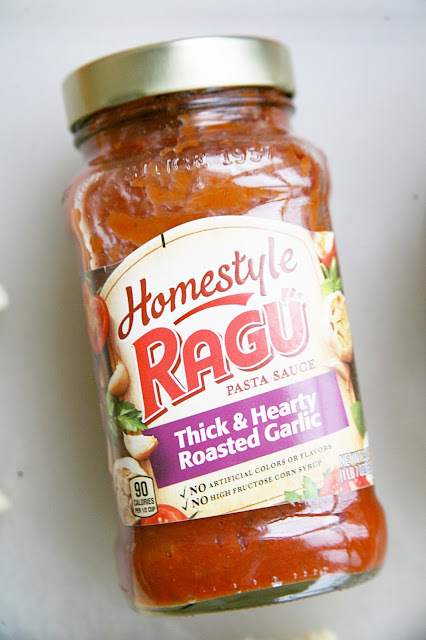 Once browned place in a small sauce pot with 1/3 jar of Ragu® Homestyle Thick & Hearty Roasted Garlic Sauce. Let simmer on low for approximately ten minutes, stirring occasionally. Remove from heat. 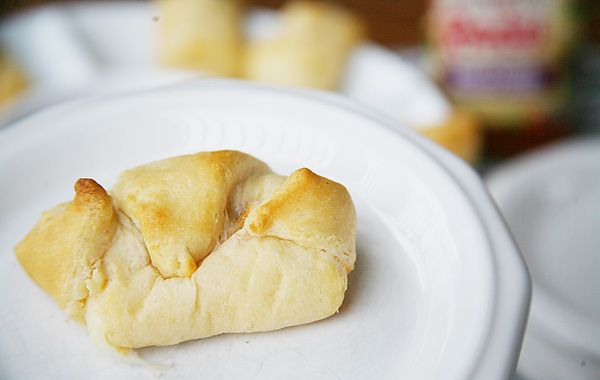 On a pan place slices of crescent rolls. 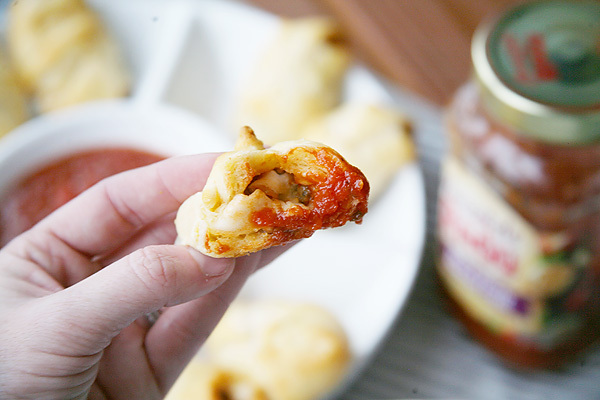 Put a tablespoon scoop of sauce mixture onto each crescent and top with mozzarella. Roll each crescent and fold all ends to the top. Heat in oven for approximately ten minutes or until brown. 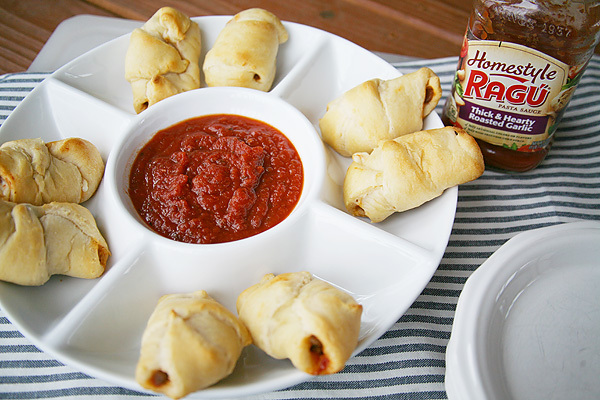 While the roll-ups are baking in the oven warm the remainder of your jar of Ragu® Homestyle Thick & Hearty Roasted Garlic Sauce to be ready for dipping. Remove crescents from oven and serve warm with sauce. Enjoy! 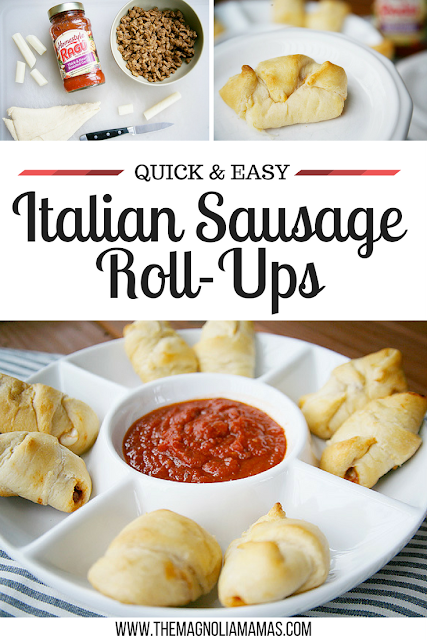 Super easy and so tasty! 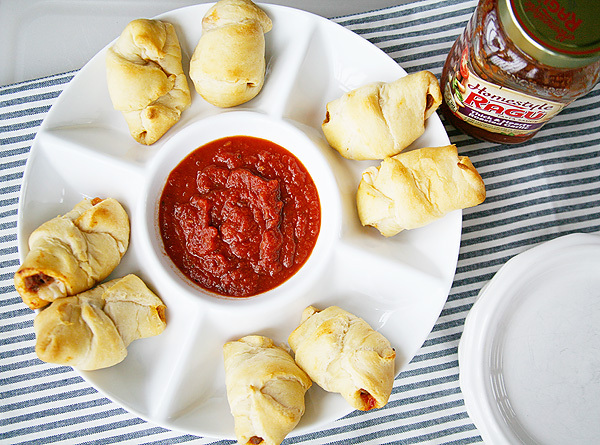 For more creative ideas to use Ragu® Homestyle Thick & Hearty Sauces for your next gathering or big game day check out the Ragu® recipe website. Warning: you might leave craving something delicious! These look so good! Can't wait to try them for our next family get together! Are they a hit with the kids?